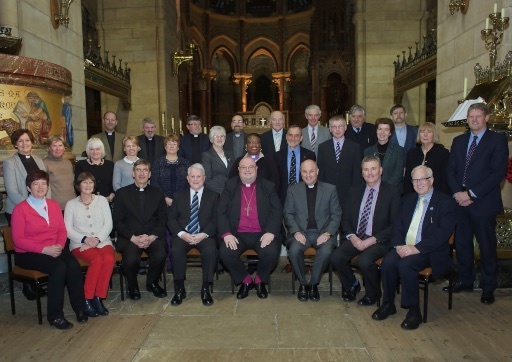 On Wednesday, 25th March, 2015, Wilfred Baker attended his last meeting of the Diocesan Council prior to his retirement after 42 years service to the Church of Ireland in Cork, Cloyne and Ross. However, as the Bishop, Dr Paul Colton quipped, ‘there’s nothing to stop you returning as an ordained and licensed priest, or, after ordination, even as Bishop of the Diocese, if elected!’ The Bishop paid tribute to Wilfred and thanked him for all his faithful work. Members of the Diocesan Council who were present posed with Wilfred for an historic photographic record of the occasion.